Five years ago, I began something new—a blog. I had created the blog’s title and web address several years before, but nothing happened. For a long time, my blog was nothing more than an empty resolution. Warm As Pie was like so many other unfulfilled promises of other good things that I wanted to do but never really did—like exercising, or flossing twice a day, or baking my own bread every week, or finally truly learning to speak French. It’s painful to say, but I’m actually quite used to not following through on my big ideas. I wasn’t too surprised to fail at blogging before I even tried. On September 22, 2009, I decided to give the whole blog thing one honest effort. I had two primary reasons for wanting to bring Warm As Pie to life. First, I was an adjunct faculty member in the English department at a big, fancy university, and I was feeling like a fraud. I was teaching writing, but I wasn’t doing any writing. In 2004, I had completed an MFA (master of fine arts degree) in creative writing, but once my thesis was approved, I rarely wrote pieces that weren’t related to the teaching of composition or the study of education. I simply wasn’t writing creatively anymore, yet I was teaching others to write and trying to convince them that writing could be a part of life. I wanted to “walk the walk” again—to live the writer’s life again. Secondly, I wanted a pretty place to record and reflect upon the beautiful things that were happening in my life. I read Blogging for Bliss by Tara Frey*, and I was won over by all the “bliss” flowing out of that book. I had two little boys at the time—a 4 year old and a 1 year old—and I already knew the frantic, other-worldly pace at which they were growing and changing. I didn’t want to forget. I wanted to live slowly and purposefully. The commitment to writing about my life felt like a promise to live the life I wanted (and still want). Blogging makes me grateful. I didn’t fail! I posted once. That was fun. I did it again and again and again. I became acquainted with a few other bloggers, and I loved the sense of community. A small band of readers—mostly real-life friends and family—welcomed my posts. People seemed to like what I was doing. They thanked me. They cheered me. They told me that my blog meant something to them. My readership is tiny, but those friends sure are loyal. Yes, Warm As Pie has slowed considerably after a couple of big moves and two more children and the beginning of our life as home-schoolers, but the pleasant comments and encouragement from readers keep me from putting this blog to its final rest. My two reasons for blogging remain true. I’m still teaching writing, and I want to continue in the practice of writing. I still want to record this abundant, beautiful life that God has given to me. 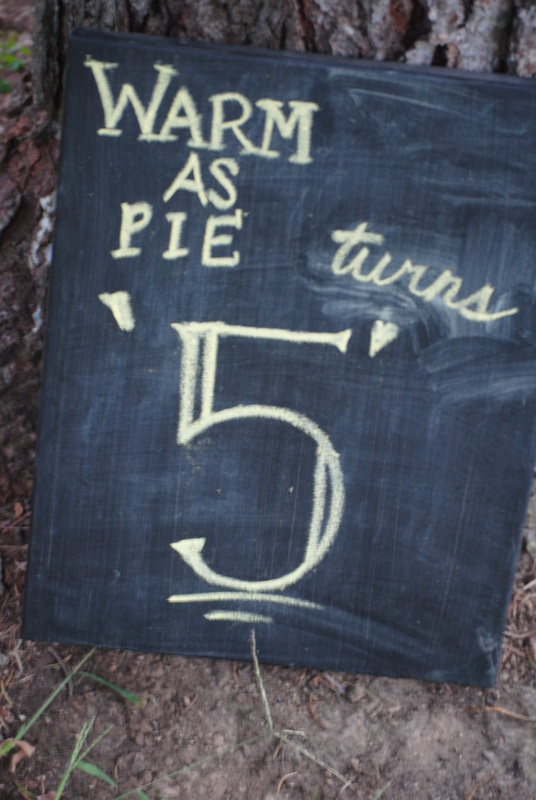 And so…I embark on my sixth year of Warm As Pie. I’ve decided to zoom in and focus on the kind of blogging that I love most: sharing how we grow together through words and images. I’m simplifying. I’m streamlining. All of the amazing possibilities of blogging has led me astray more than once, but I’m back to the basics. I will be making some fun changes in the next few weeks. I CANNOT wait to share a special little project that has been brewing for months. Eeeee! I’m excited! If this is your first time here, welcome. You’ve come at a good time. If you’ve been with me awhile, thank you. Thank you for caring enough about me and my family to stop in from time to time. *Blogging for Bliss now has many outdated references and resources. A lot of the blogs featured in the book have moved or closed. However, it is a gorgeous book with plenty of helpful information. I picked up an excellent used copy on Amazon for ONE PENNY! With shipping, I acquired a book that I love for $4.00. Nice! That’s what I love about blogging too — it makes me write! Can’t wait to see what you have in store for us. I love you Erica G!!!! – I am sorry I feel the layout is atrocious. Certainly one of the good reasons I don’t get new cars is since they are UGLY. There isn’t any sense of nuance or continuity while in the bodies, and I am not considering all the technology primarily put there for illiterate drivers.